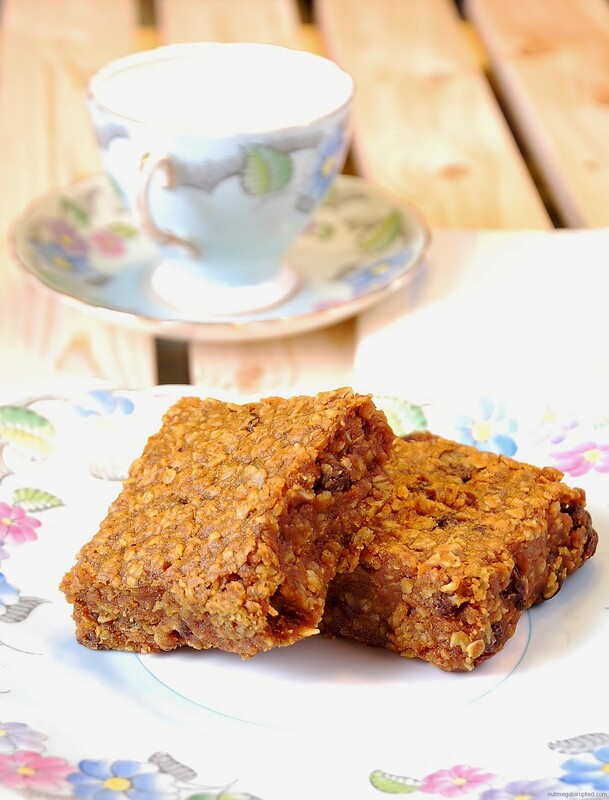 Just the name alone Pumpkin Peanut Butter Oatmeal bars, where can you go wrong. More like where can you go right! When I seen the Tweet Tuesday afternoon I immediately walked over and hit 350 on the oven. This little gem comes from Averie over at Love Veggies and Yoga. It is a fantastic recipe with many different variations, using more or less of what you enjoy the most. For the first batch I use the main recipes and I added a 1/4 cup of dark chocolate mini chocolate chips and a 1/4 cup of regular sized butterscotch chips. It turned out quite light and soft. A very tender bar. If it had cooked it a few minutes longer with would be more firm, I was just cautious to not over cook it and have it too hard or dry. The addition of the chips was nice but I think for the second batch I will go with the main recipe plus raisins and a touch more cinnamon. I like a bit more chew to my bars and the raisins will add just the bite I am looking for. Plus, omitting the chocolate chips will also result in a firmer bar. I also used one cup of white sugar in the first batch as I just ran out of brown. For the second batch I used one cup of brown sugar and a half cup of raisins. I really enjoy it without all the chocolate chips. It is a touch more firm and has that granola bar flavor, which I espically enjoy! Which ever variation you try, it will be hard to stop at just one! And before I forget to mention, these are gluten free! options: raisins, chocolate,whiite, peanutbutter or butterscotch chips. Up to a half cup. JoAnn, thank you so much for stopping by! I need to check out your site further. I did a quick look last night, now I need to sit with a cup of tea and explore! I am just new to learning gluten free, thanks for your advice on the oats. I do not have any gluten issues but I am very interested in making more gluten free things for my family. Anything to be healthier is a good thing! I know from reading it is going to be very different from the way I usually bake. I appreciate your feedback on that recipe! Thanks and please do stop in again! Recipe looks great. Your recipe states “oats, whole rolled not quick cooking”. For this to be glutenfree, you must use Pure Oats. The oats will work the same, they are just a bit firmer in texture. They are. And it is such a versatile recipe that you can really play with the ingredients to make it just perfect for your families tastes. Thanks so much for posting the recipe! I am defintely trying more of the pumpkin goodness you have been posting! Indeed, I would have used brown sugar the first time as well if I had not been out. And where cinnamon is I love the dark flavor of brown sugar. Sure a neat way to use to pumpkin!! Thanks again for sharing it! Glad you made them and figured out what you like best. Brown sugar = chewiness. So any time you eliminate that OR use a higher portion of white sugar to brown sugar, you will increase the crispiness and decrese the chewiness, as a general rule in baking..but you probably already know that. Agreed! Glad I seen your Tweet about them! I really enjoyed the ones with the raisins over the chocolate chips. I think the brown sugar also made a differece in the taste and texture. The white sugar one was definitely more cake like. I forsee many varations of these to come over the season! They leave a lot of room for experimentation. Thanks so much for stopping by Carrie! I love that we were sorta baking these together last night! 🙂 I opted for raisins in mine, too, and cut the sugar down to just 3/4 cup brown, no white. It’s easy to underbake them, that’s for sure. But they came out pretty good. I think next time I’d up the pumpkin a little and cut down on the peanut butter, if possible.